I backed the GCW-Zero when they had their kickstarter campaign. Now, 20 months later, I received a console as a reward. It arrived last monday, so I've had time to study it. This is already a brilliant and easy system for a programmer. It's not so great for others because there's shortage in software. There's some more in unofficial index. The worst thing is that there's no download app for getting the packages. You need to drive them in over wifi using SSH or copy them to a memory card. After dropping my public key to the card, it is a passwordless but secure workflow. Instead of plastered over the whole system, the software is packaged as OPK -packages. To install, you copy them into an apps/ directory. I can do whatever I want with the console. It starts up faster than I anticipate, something to do with MIPS probably. The "firmware" is filled up with useful libraries. You can actually publish using pygame on this platform, without any kind of trouble. The script just runs. There's $HOME/.program -directory to store config and writable data for a program. According to porting guidelines. The platform doesn't have a graphics driver blob. It's all open source. The cross-porting development kit allows me to port whatever software. For example, I'm writing a compiler frontend to LLVM which is able to produce gcw0 -binaries. It's a generic purpose computer that fits into my pocket. The battery seems to hold for hours before it requires a charge. It is about to need it's third recharge this week, and I've been playing a lot. The thing has an OTG USB port. This and the HDMI port doesn't entirely work because the drivers aren't complete yet. The hardware couldn't drive separate outputs on the HDMI and front screen at the same time. But the USB port is interesting. Once it is working, you could connect different peripherals to that port. Peek inside USB memory stick, connect an instrument or draw with a wacom tablet. Otherwise everything would seem to work. There's not been surprises that'd have pissed me off. You can, by the way, access rumble and g-sensor on the board from the libsdl2. First of all this thing attracts my kind of people who love to tinker and thinker around. Someone might consider that as a bad thing alone. There's an ugly CE -sticker in the bottom. I remember they mentioned it in the kickstarter. But it sure is ugly! Getting uglier all the time. The user-interface is a bit inconsistent between games. Some of the commands use weird button bindings. Friend wondered why SELECT and START did something entirely else than what read on them. Start doesn't always return to the main menu. Fortunately, there's a reliable way to get back to the menu. Display is 320x240. Seems to cover about same area as 320x240 on my 22" desktop screen. You're looking closer though, so it could be twice as large. Mostly concerning is the quality of the input buttons. This is a gaming device after all. When I got it, the D-pad required lots of pressure to press right. Also some buttons sticked down few times. 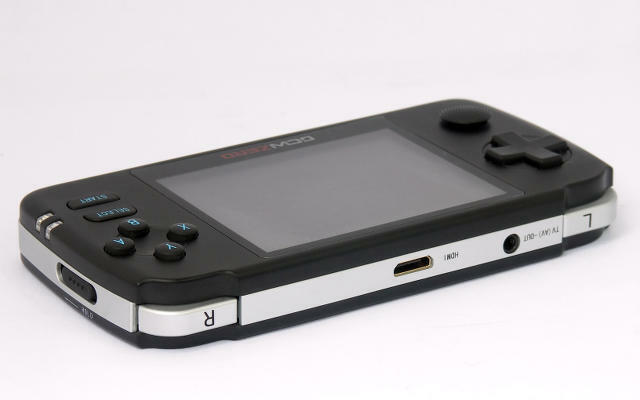 The shoulder buttons have insymmetric feedback. The D-pad seems to have a permanent horrible screaking. They say the silicon lubricant will fix it. Nothing fixes the annoying audible clicks that come from the SELECT/START. They're microswitches.